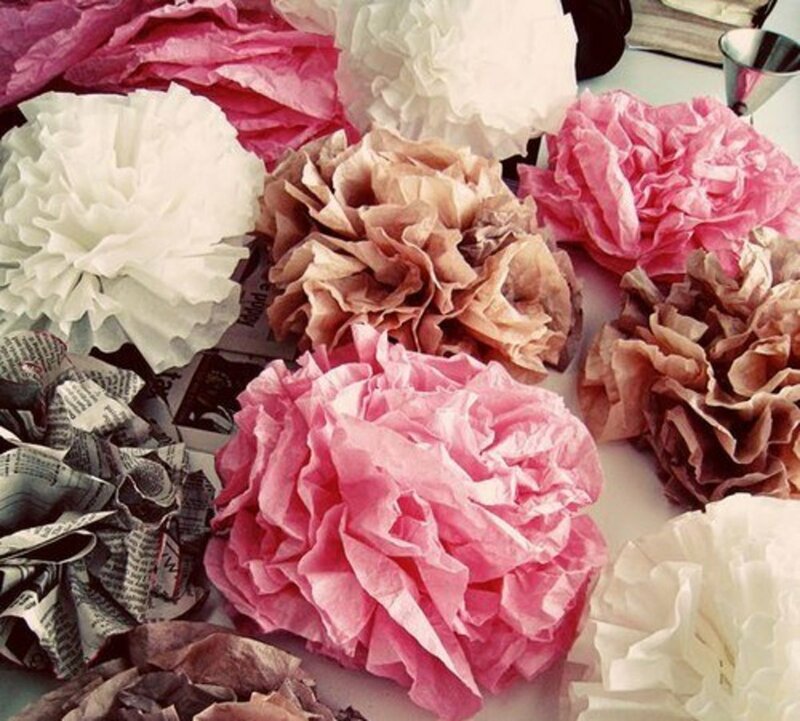 My aim with DIY projects around the home is to look for innovative space-saving ideas and save costs on materials by recycling. 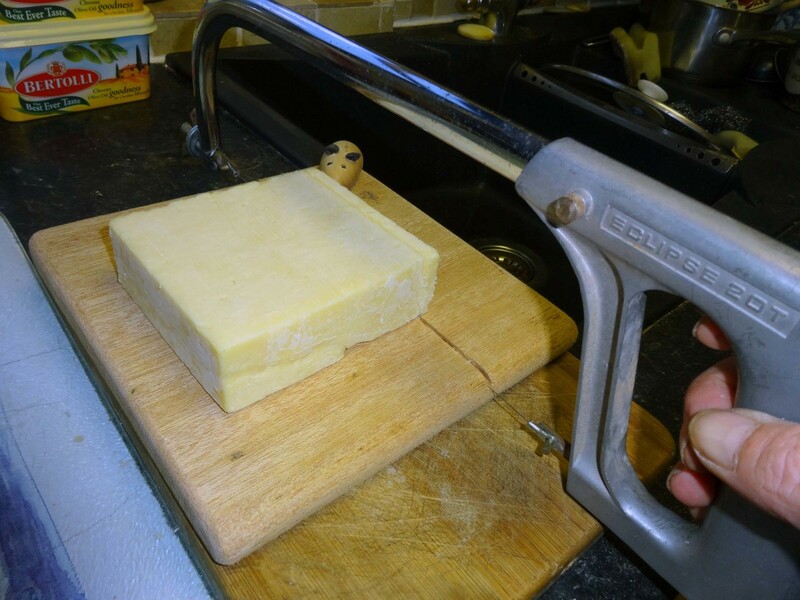 Cutting cheese with a hacksaw fitted with cheese wire. A cheese wire is something I've always fancied, but my first experiences of having one were disappointing. I bought my first cheese wire from a tourist gift shop while on a day trip to Cheddar Gorge; which is famous for its Cheddar cheese. The wire and cheeseboard was only a novelty gift and didn’t cost much; a short piece of cheese wire attached to a rather cute wooden mouse at one end as the handle, and at the other end fastened to a rather simplistic, small piece of pine wood pretending to be a cheeseboard. My impulse buy was for a Christmas stocking filler for my son, who also loves his cheese. My son was delighted with the gift, and although it did quite a good job it was limited in its use, and it wasn’t long before the cheese wire snapped. I then bought a proper cheese wire and board, costing a little more, and which was a little more effective; but it was still limited in its use. Specifically, no matter how much I tightened the tension nut the wire always seemed too slack and was too short so you could never slice anything other than rather small blocks of fairly soft cheese. What I really wanted was something that would cut quite large blocks of harder cheeses; such as a half-pound block of Mature Cheddar. This article is about my journey to finding a simple solution to a simple problem of making an effective cheese wire that actually cuts cheese effortlessly, like butter. Therefore, after some thought, I decided to have a go at repurposing an old hacksaw blade, and making an accompanying cheeseboard with a grove to fit the cheese wire. As anyone who's tried will know, cutting large blocks of hard cheese into smaller blocks with a knife is almost impossible; whereas a cheese wire tensioned between two handles will cut through it like butter. Although, for slicing smaller blocks of cheese a sharp knife is fine, albeit a cheese wire held under tension gives a more precision and cleaner cut, and allows you to cut very thin slices. Although we use other cheeses, Cheddar is the cheese of our choice for daily use. For cooking I often use a cheese grater but at other times, such as a side dressing for a meal or on cheese crackers, I prefer it sliced. Small packets of cheeses such as cheddar can be sliced quite easily with a sharp knife on a cheese board, but it can be fiddly to cut very thin slices and cutting large blocks with a knife takes a lot of effort. My wife buys whatever Cheddar cheese is the cheapest, often small blocks but sometimes the supermarkets sell the catering blocks at a discounted price. When she does get a catering block I’m then given the arduous task of cutting it into smaller blocks for individually wrapping for the freezer. Cutting a large block of Cheddar cheese, even with the largest sharp knife, is hard work. I invariably end up using a bread knife pressing down hard from the top, and even then keeping a straight cut is almost impossible; the knife invariably veers off at an angle as it works its way through the cheese. Hence, upon purchasing our first cheese wires I was eager to give it a go. However the problems of using cheese wire is that it needs to be under high tension in order to slice through the cheese, and it needs to be firmly attached at both ends to create that tension. Even then it will bow in the middle, hence the need for a cutting slit in the cheese board for the wire to go a fraction of an inch further to slice right through the cheese. The novelty cheeseboard we bought, with the wooden mouse attached to the cheese wire as the pulling handle, was not fit for purpose. It didn’t matter how hard you pulled on the mouse, you just couldn’t get enough tension for the wire to slice right through the cheese; and besides, the cheeseboard itself was too small for practical use anyway. In my first attempt to find a solution, the first step was to find a secure way of attaching cheese wire to a cheese board and pulling handle. After a refreshing cup of coffee, and a good think, I decided that a terminal crimper and crimp terminals would do the job. The next issue was to find a suitably sized cheeseboard, the novelty one we bought was too small; therefore I decided to adapt our bamboo chopping board. 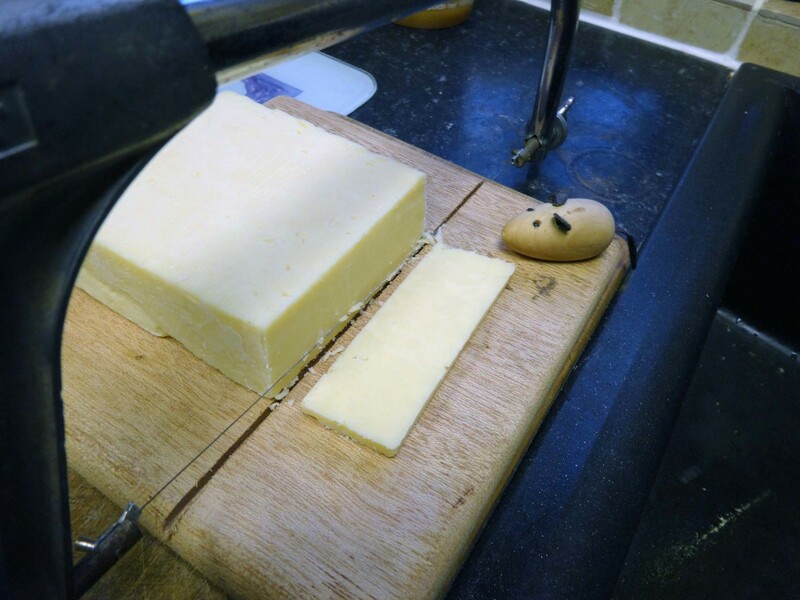 Using a crimp terminal, I securely screwed one end of the cheese wire to the edge of the chopping board, and fixed the wooden mouse at the other end. On trial, this worked quite well to a fashion, but there still wasn’t enough tension for the cheese wire to slice through the cheese effortlessly and fully. 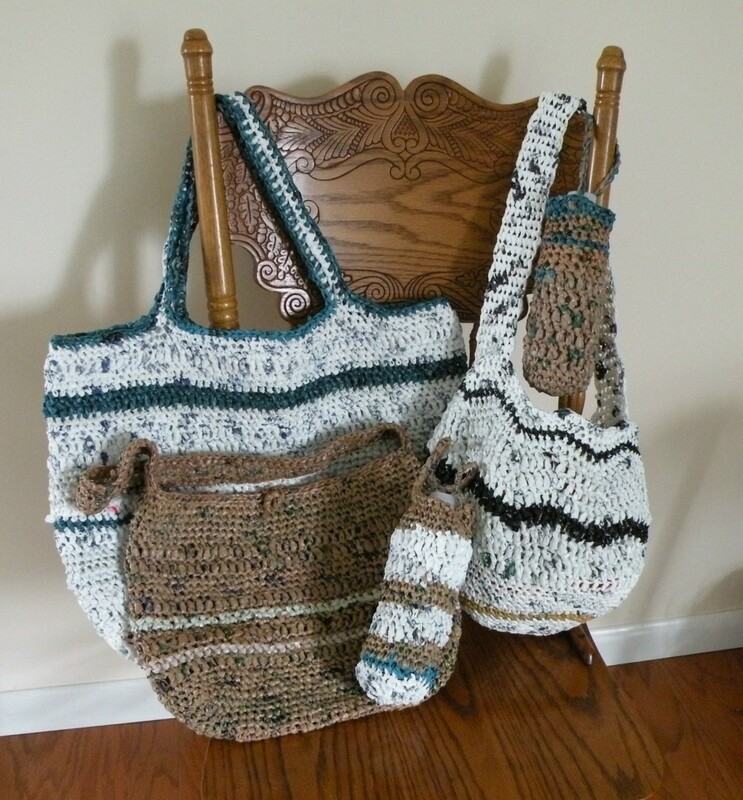 Therefore it was back to the drawing board, while I had another cup of coffee, and a further think. It was while I was sipping my coffee in my workshop, and looking around for inspiration and ideas that I spotted my hacksaws hanging up on the pegboard. I thought to myself, hacksaws hold hacksaw blades under tension, so why not a cheese wire? With that moment of inspiration, the only other thing I then needed was to find was a descent cheeseboard, with a slit to take the cheese wire. 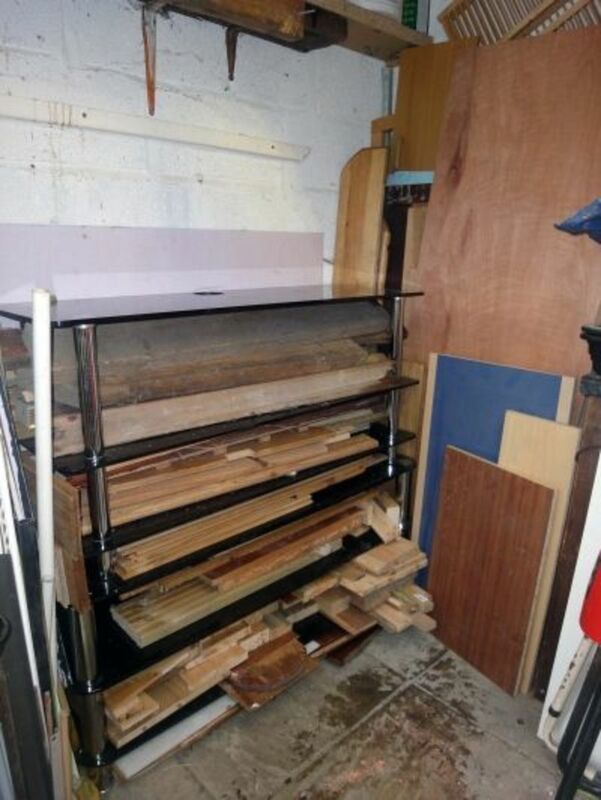 In looking around my workshop I found a piece of scrap wood that was ideal; and old teak shelf, previously repurposed from what was once a wooden windowsill. ‘Sorted’, as a friend of mine frequently quotes when we find solutions to our DIY problems. This DIY project, born from the necessity of using cheese wire under tension to slice through cheese like butter, describes in details my process of repurposing a hacksaw into a cheese cutter and making a cheeseboard of a suitable size with a slit to fit the cheese wire for that final cut in slicing cheese. 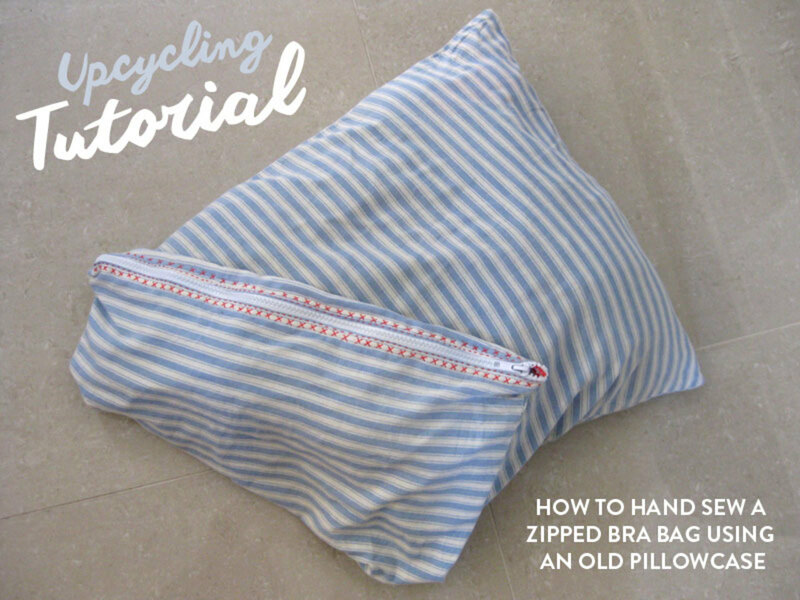 This is a low budget DIY project repurposing and recycling existing materials which you may find in most home DIY workshop sheds or garage e.g. hacksaw and scrap wood. 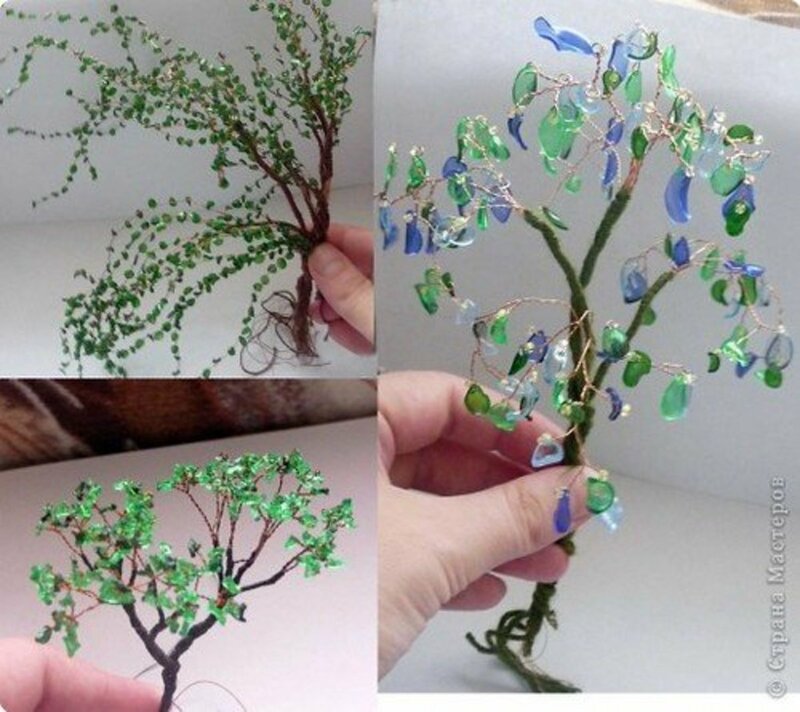 The only thing you may need to buy is some cheese wire, which shouldn't cost more than a few dollars. When ready, remove the old hacksaw blade (the hacksaw shown in the image below had a stone cutting blade for cutting stone slabs). Tools required to upcycle hacksaw blade into a cheese cutter. 2. This is probably the most fiddly and most critical part of the project; getting the cheese wire to the correct length with crimp terminals securely attached at both ends. For it to work properly when fitted into the hacksaw like a hacksaw blade you will need to tighten the cheese wire to a high tension; the tolerance in any variation in the length of the cheese wire to successfully achieve this is surprisingly quite small. Using the wing nut on the hacksaw you will need to set the blade distance in the hacksaw to the shortest distance, and you will need to carefully measure that distance. 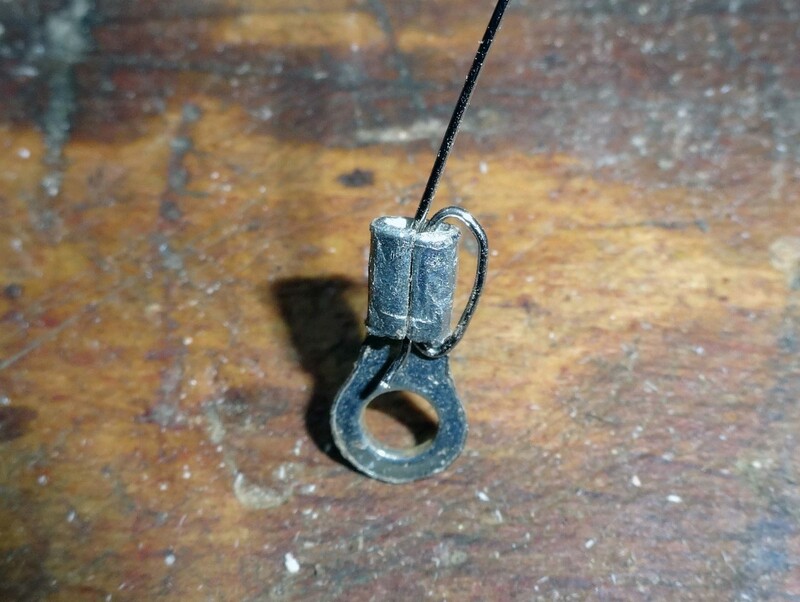 Loop one end of the cheese wire into one of the crimp terminals; then pull tight with your pliers to achieve the result as shown in the image. Crimp terminal fitted to cheese wire. 3. Squeeze hard with the terminal crimper to fix the crimp terminal firmly to the end of the cheese wire. Taking into account where the ends of the crimp terminals will latch onto the hacksaw. Repeat the process to attach a crimp terminal at the other end of the cheese wire, at the correct distance from the first crimp terminal; bearing in mind that at this stage the cheese wire is not under tension so none of the slack has been taken up. Therefore, you may need to make the wire slightly shorter than you would think, but not too short or otherwise when you come to hook it onto both ends of the hacksaw it may not reach. Using a crimper to fit a crimp terminal to the end of cheese wire. 4. When the crimp terminals have been successfully fitted to both ends of the cheese wire, check for fit into the hacksaw, and once satisfied cut any excess wire to make it safe e.g. to prevent the risk of any sharp ends accidentally cutting or scratching you when using the cheese wire. 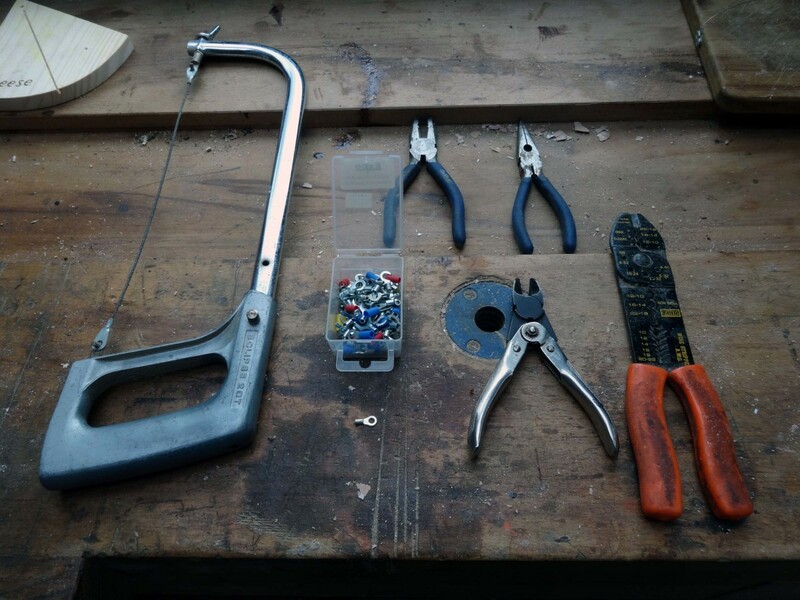 If when doing a test fit the cheese wire is too long or too short you will need to back track and try again; which can be fiddly, especially once the crimp terminals are securely fitted. 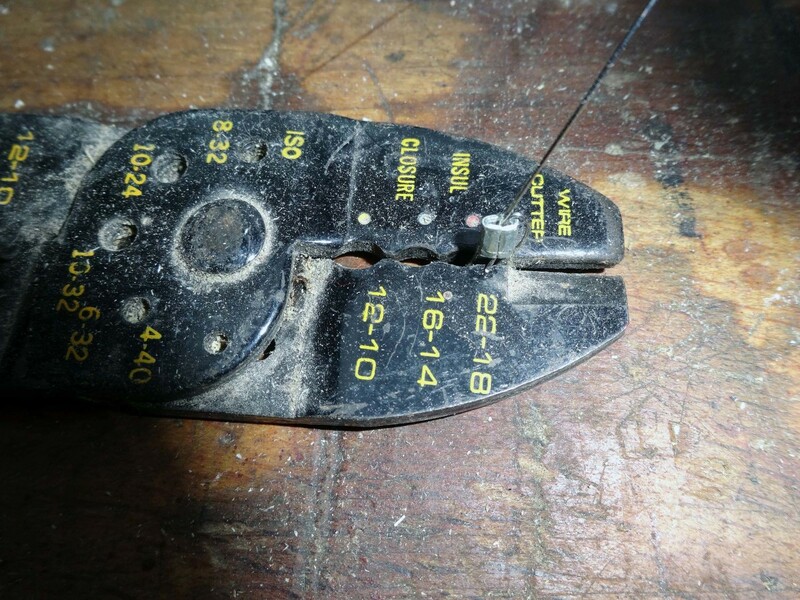 However, some hacksaws have two or more distance settings so if you are not confident start on the longest distance setting so that if you do have to start over again you might be able to just snip off one of the crimp terminals. Having repurposed the hacksaw with cheese wire to make a cheese cutter, obviously hanging up what is traditionally a workshop tool in the kitchen might look a bit odd. However, with a bit of car paint primer, and a spray coat of car paint in any colour of your choice e.g. bright yellow, then you could make it look a little more like a specialised kitchen utensil. 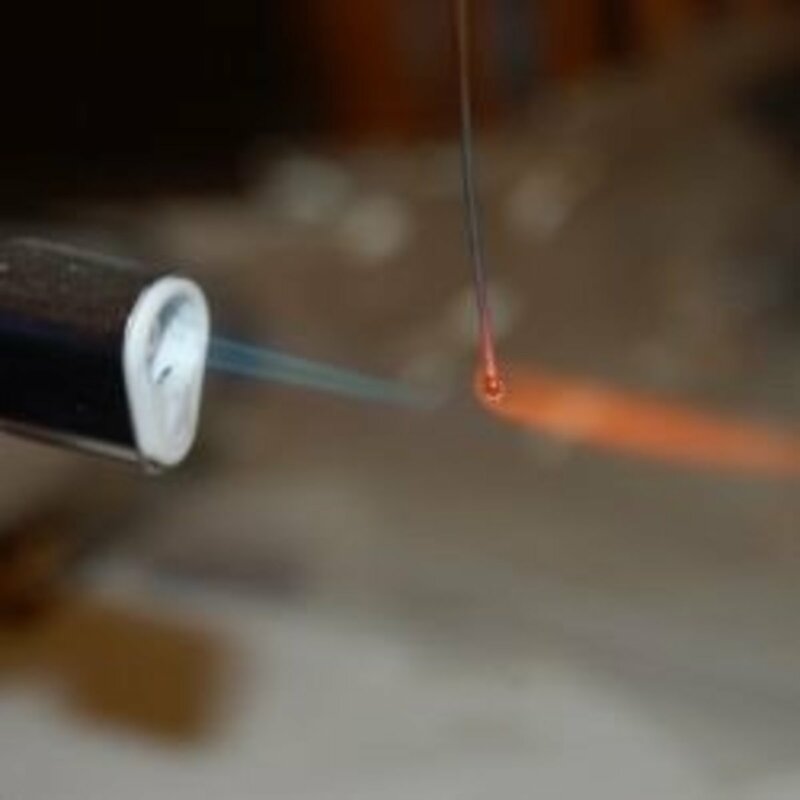 If you do spray paint it with car paint, remember to temporarily remove the cheese wire until the paint is fully dried. Cheese wire fitted to a hacksaw with crimp terminal. 1. Cheeseboards are not expensive to buy but if you have a piece of suitable scrap wood, it can be fun to make, and with a bit of imagination and artistic flair you can make it any shape and size you wish. The important thing, as with any other food board e.g. chopping board or breadboard, it should be finely sanded but not painted, wood stained, oiled, waxed or varnished. For this project I found an old shelf in my workshop, which had previously been repurposed from a windowsill. The wood being teak is a nice piece of quality hardwood ideal for a cheeseboard. You could use just about any real wood you like, including pine, although I think hardwood is preferable, especially oak if you can get your hands on it. 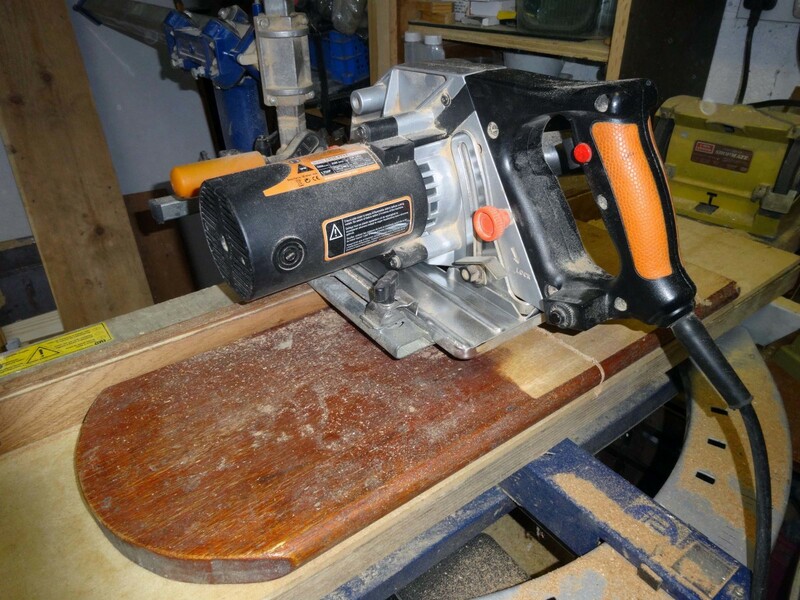 The first task in making the cheeseboard was to use a belt sander to remove all the years of wood stain and to get it back to the bare wood. 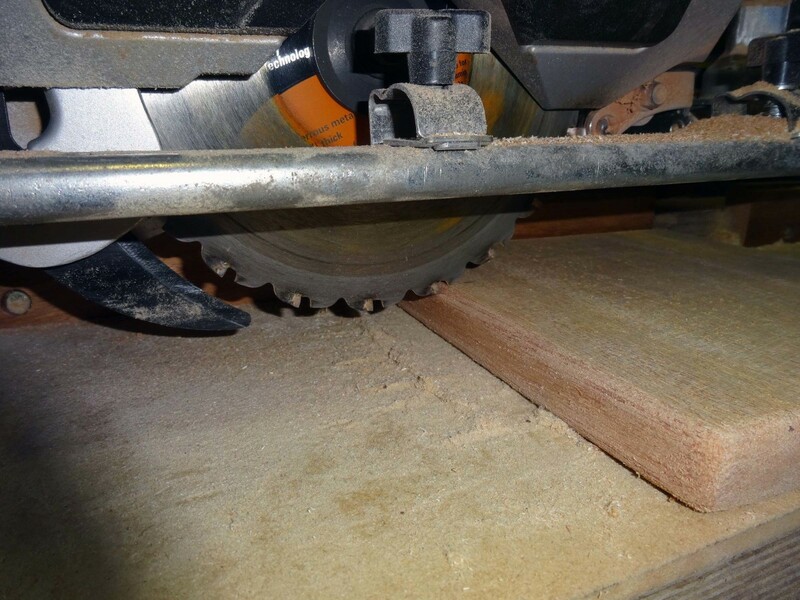 Rather than cut the wood to size before using the belt sander, it's easier to clamp the wood to your workbench and sand down just the area you intend using for the cheeseboard. Upcycling an old teak shelf to a cheeseboard. 2. 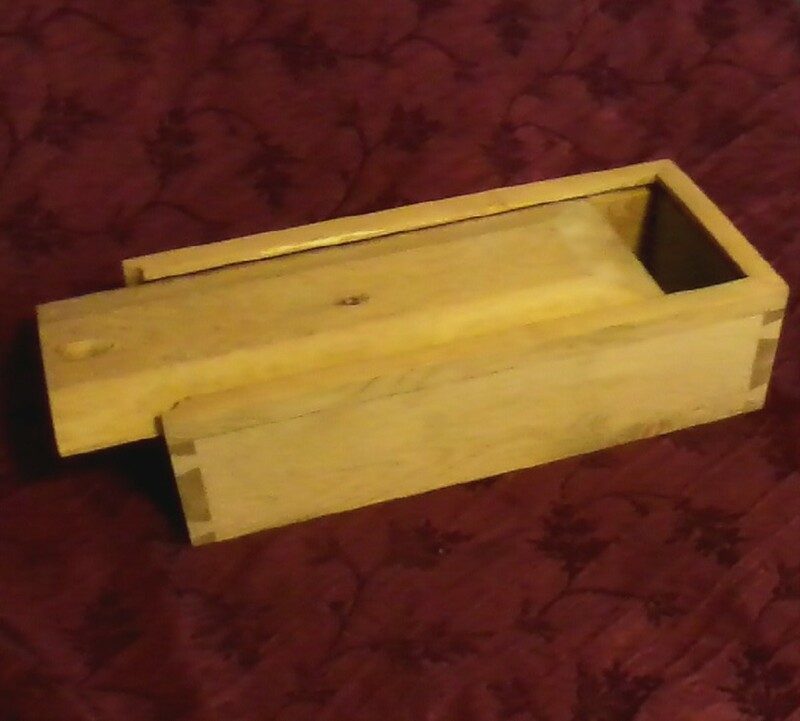 Once it was sanded back to the bare wood I used a circular saw, attached to a jig, to cut the wood to the desired size; which in this case was 8 inches square. Although you could use any suitable electric or hand saw e.g. a jig saw. Cutting an old teak shelf to size to make the cheeseboard. 3. 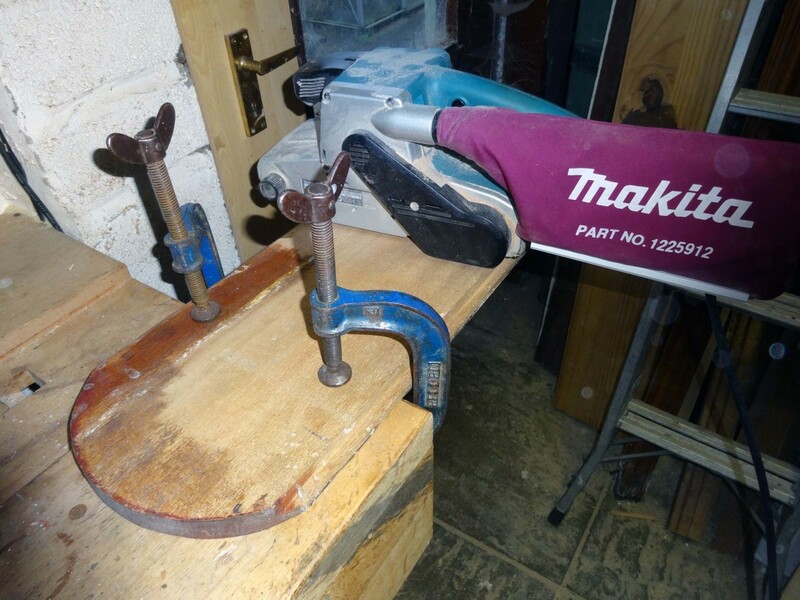 Having cut the wood to size the next step was to round the edges off with a sander; using course sandpaper initially, and finishing with a fine grade sandpaper to give all the surfaces a smooth finish. 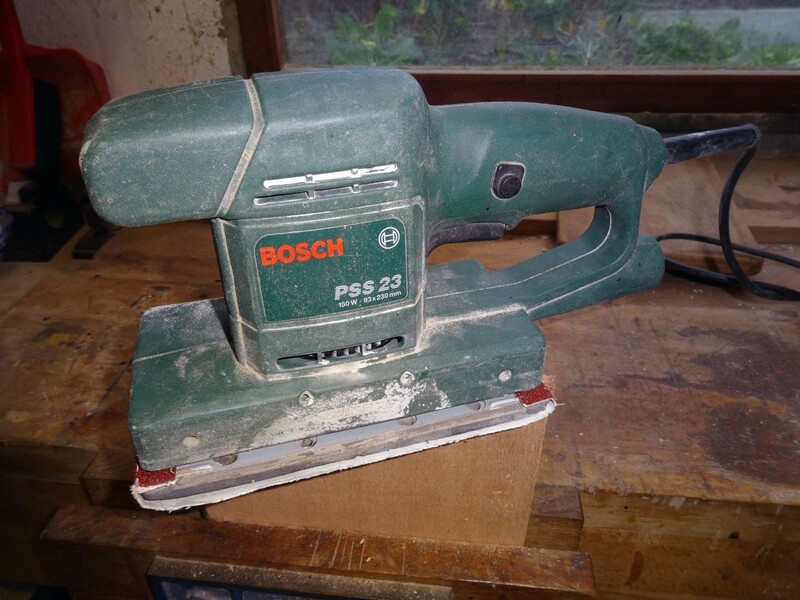 Alternatively to using a sander you could use a router, with a round profile router bit, to shape the edges before sanding smooth all the other surfaces. Sanding the surface smooth with fine grade sandpaper. 4. Now comes the all-important groove across the top of the cheeseboard into which the cheese wire slides, when cutting cheese, to get that final cut all the way through the cheese. The groove should be about 5mm (1/4 inch) deep. I used a circular saw on a jig, set to the required height (as shown in the photo), although a bench saw would be easier if you have one. Alternately, you could do it using a hand saw, and just taking your time to work slowly and evenly across the surface until the desired depth is achieved; gauging the correct depth by eye. Cutting the groove in the cheeseboard to accept the cheese wire. 5. 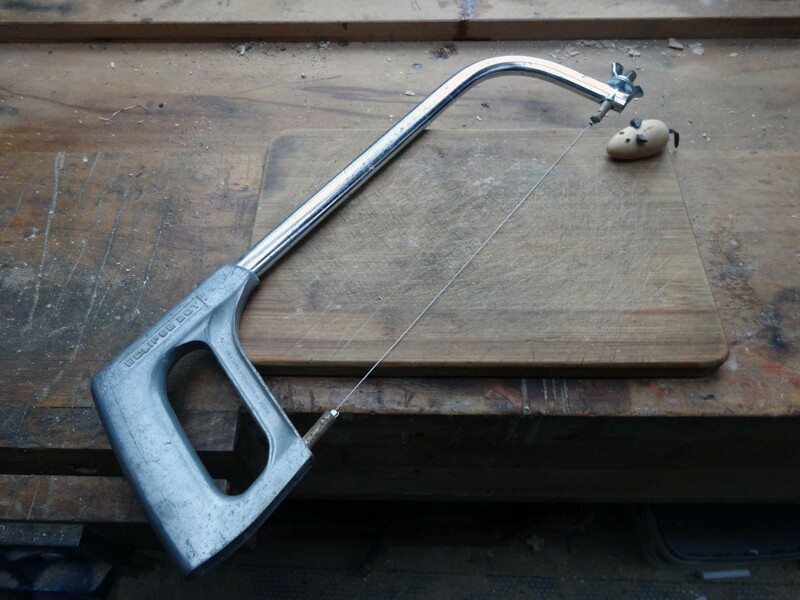 As I repurposed a hacksaw to make a cheese cutter, the wooden mouse that was attached to the cheese wire of the novelty cheese board became redundant. So, as a finishing touch, I repurposed the wooden mouse as a decorative piece to sit in one corner of the newly made cheeseboard. 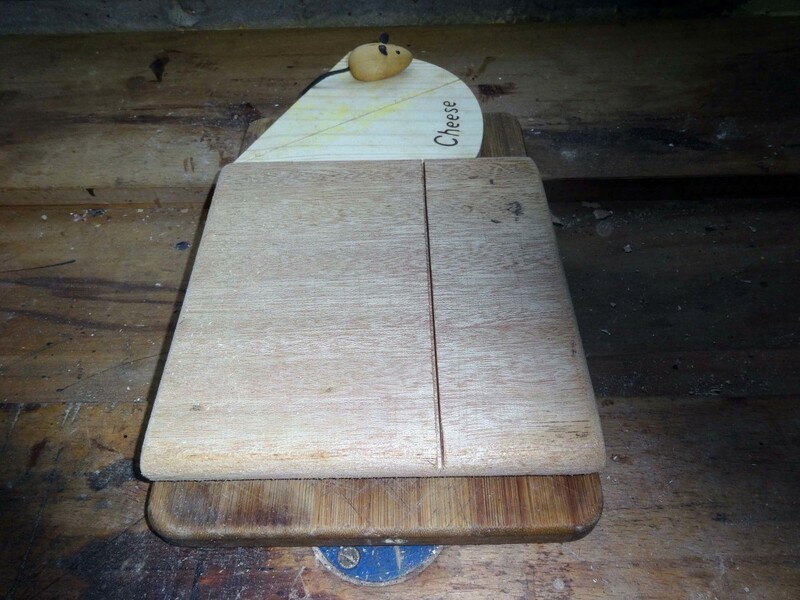 Previously, when not in use, it sat on the other cheeseboard with the aid of a thin dowel peg on the underside of the mouse that slotted into a hole on the cheeseboard. 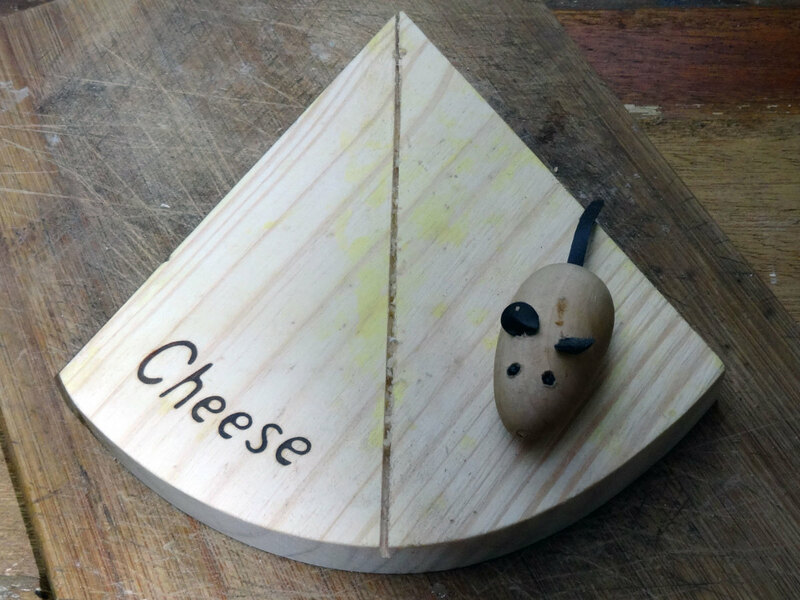 Therefore, I just drilled a hole slightly smaller than the dowel peg in one corner of the new cheeseboard so that the mouse now firmly sits in the corner looking on as you cut and enjoy your sliced cheese. Testing the new cheese cutter and cheeseboard. 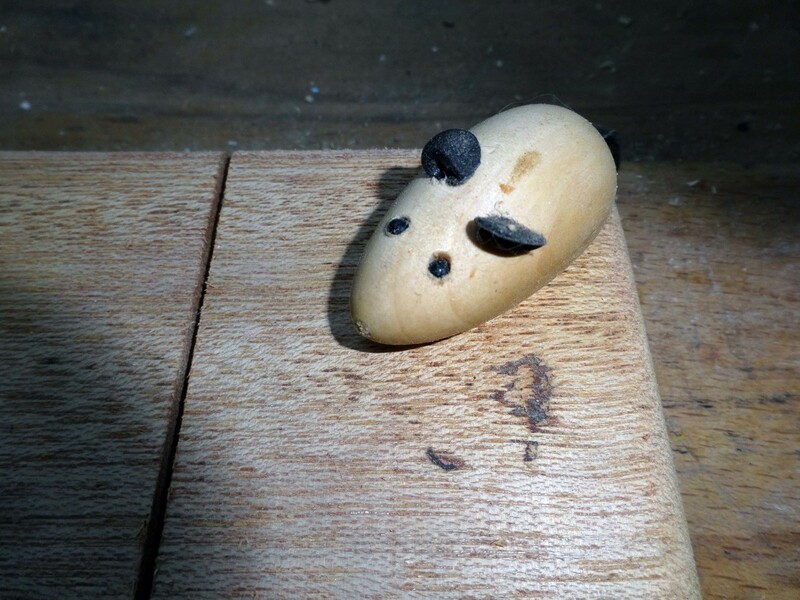 Wooden mouse transferred to the new cheeseboard. How Do You Slice Your Cheese? For cutting small blocks of cheese you could use either a sharp knife or a suitably tensioned cheese wire cutter.